With the Darren Wilson indictment announcement looming in the case of slain black teen Mike Brown, the entire country sits on the edge of its seat. While the City of Ferguson and its new police coalition prepare for possible violence if no indictment is issued, Ferguson protesters prepare for just the opposite: peaceful protests. Protesters recently released rules of engagement that enumerate expectations for police interactions with demonstrators. Protesters also organized comprehensive civil-disobedience training to prepare themselves for possible harsh conditions and practice deescalation tactics. The training sessions were reportedly filled to capacity with a diverse turnout of different ethnicities and multiple generations, emblemizing the transcendence of outrage over carelessness for black life from black problem to American problem. Protests in Ferguson remain salient through both the intense mobilization efforts on the ground in Missouri and the virtual connection cultivated with activists and watchers across the nation. By utilizing direct contact online, activists control their own narrative and cleanse their message of misleading media framing, proving that 21st-century civil-rights movements need not rely heavily on traditional methods of communication with the public. Most recently Ferguson protesters launched a text-message-alert system through MailChimp. The system allows people to sign up to receive a text of the Darren Wilson indictment announcement as soon as it is made available to Ferguson protesters. This proactive alert model is a stark contrast to the memories of waiting in front of the television or radio for the George Zimmerman and Michael Dunn verdicts. Ferguson protesters continue to hone in on this national network of activists, concerned citizens, and allies across the country through establishing the Ferguson National Response Network. The Tumblr page is a collaborative venture that allows activists to submit a proposal for demonstrations in their location if there is not already one listed in that area. 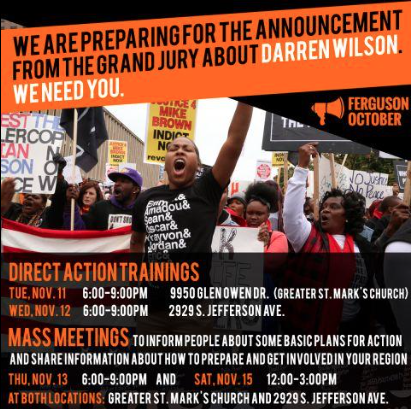 Currently there are a total of over 60 different Ferguson response gatherings scheduled for either the day of or day after the announcement of the Darren Wilson indictment. While we are all unsure of exactly when the announcement will occur, The Root reports that sources indicate that it will likely take place today, Nov. 17. Given the well-executed mobilization efforts thrusting the continued unrest in Fergson onto the international stage, it is safe to say that activists across the nation are sufficiently prepared to continue protesting into the the cold weather as we vehemently fight for the recognition of black humanity.